The Abbot of Venice took a long sip of her cappuccino, and sighed. This would be the longest day of her life, thought Shelly Cabrera. Not only was it the 200th anniversary of the founding of Venice, but the Doge of Venice – that one on the Italian peninsula – was in town, and she was expected to make a momentous political decision. And it had only been a year ago that her party, the Dolphins, won a majority in the Venice Assembly and installed her as Abbot. Now she had to fill the shoes of a Venice icon, the late Bill Sawyer of the Justice Party. “There’s nothing between Marco and I, Chester. It’s just politics,” retorted Shelly. “Chester, do I have to? There’s so much to do today,” complained Shelly. Shelly descended the stairs and caught the first municipal launch heading down the Grand Canal. She arrived at the start of the parade – the old city hall museum – to the cheers of the pagans. The short trip down the canal followed a diagonal line of what was once called Abbot Kinney Blvd. in old Venice. That was before the great subsidence. In the early morning hours of July 26, 2065, the residents of Venice were tossed from their beds by one of the largest earthquakes ever to hit a populated area. Because of the hour, only a few thousand people in the Los Angeles megalopolis were killed. But then thousands more died in days of aftershocks nearly as large as the first giant quake. Less than a week later, the first evidence of the subsidence was discovered. Los Angeles was sinking. Not rapidly, but steadily. The evacuation began in earnest. Most Angelenos trekked to the north, never to return. In the mass chaos, no one outside of Venice noticed that their sandbar was not sinking. In Venice, the evacuation was from the lower parts of the city to the sandbar that runs parallel to the beach and rises a few feet above sea level. Others set up camps on Mar Vista hill, which had seceded from Los Angeles and joined Venice a few years ago. Venice had finally restored cityhood following the 2048 law passed by the United Nations General Assembly that prohibited outside intervention in any people’s decision for self-determination. Within a few weeks Venice voted for cityhood, and a few months later, the nation of California came into being. Meanwhile, on the Italian peninsula, the Serene Republic of Venice was proclaimed. Later, under the leadership of Marco Zitelli, it became a leader of the small nations caucus in the United Nations. The small, but historic, country became a trading power by sending its giant cargo airships throughout the world, when the petroleum crisis made jet airplane freight prohibitedly expensive. In Venice, California, its Abbot, Bill Sawyer, worked like a mad man, rallying Venetians to stay put. Those who still had homes above water took in those who had become homeless. Boats that broke loose from their moorings in the now submerged Marina were commandeered to find food and fresh water to keep the bedraggled Venetians alive. Sawyer seemed to be everywhere, using his great bulk to help Venetians move their meager belongings to higher ground, or to upper floors of submerged houses. “Now I know why I spent all those years pumping iron,” Sawyer supposedly said after a particularly strenuous day. Sawyer knew that California was in chaos, and couldn’t help. Although a great deal of aid poured in from Pacifica in the north, the Rocky Mountain Alliance and Mexico, little of it found its way to what had become the island of Venice. In recent years, the town of Venice had established cordial relations with that other Venice, in Italy. In desperation, Sawyer sent a plea to the first Venice asking it to remember its stricken namesake. Three days later, when the situation was growing desperate for the Venetians, and even Sawyer was almost without hope, the refugees raised their eyes to see three giant red airships emblazoned with the Winged Lion of Venice hovering overhead. As every school child knows, those airships bore food, medicine, earth moving equipment and pylons upon which to base new buildings. Within days, canals were being dug and the dirt and mud was piled up to create little islands surrounded by streets of water. Before long, 30-foot steel pylons brought from Italy were driven into the ground to make sturdy foundations for new buildings. Venice spread out, incorporating the remnants of the Palisades and Ocean Park. But few of the shell-shocked former residents of Los Angeles wanted to take a chance on living on an island bordered by a new inland sea full of sunken buildings. Sawyer and a few thousand hardy Venetians were left to build a new society, much to their own choosing. After the parade, Shelley walked north on Ocean Front Walk from the Windward Plaza, past Jim Morrison’s tomb. Workers were busily installing the loudspeakers and holographic projectors that would carry tonight’s festivities -and her talk – up and down the Ocean Front. “Yes, yes, I know. You have your Venice, and I have my Venice. But please humor my fantasy,” he pleaded. 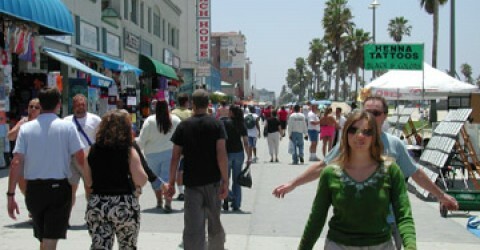 Hours later, the Ocean Front Walk was jammed in both directions with Venetians. It seemed that the entire city of 125,000 had turned out to celebrate its 200th anniversary. Venice musicians had been performing on nearly every block until the holographic projectors flashed on, showing Abbot Shelley Cabrera approaching the podium on the second floor terrace of the municipal hall. “My fellow Venetians, Doge Zitelli, honored guests, it is my great pleasure to speak to you at the beginning of the third century of our great and unique city. Venice is more than buildings and canals. It is a state of mind. Throughout our history we have been trying to define this state of mind, through poetry, painting, song, sculpture and lifestyle. Even today, we do not have the words that describe exactly what is Venice. But we will keep trying, and by so doing, create more and more art. Suddenly Shelly felt that yet another earthquake had come to strike her down at her moment of decision. Then she realized that it was the deep roar of conga drums and thousands of Venetians applauding her words. Shaken, she stepped back from the podium and was quickly replaced by Venice’s finest salsa band. The party of the century had begun. Chester was almost the last person to see Shelly that night. He glimpsed her and Marco climbing the stairs to her third floor apartment. Then, he turned, yelled “Viva Venice” at the top of his lungs and waded into the celebration.